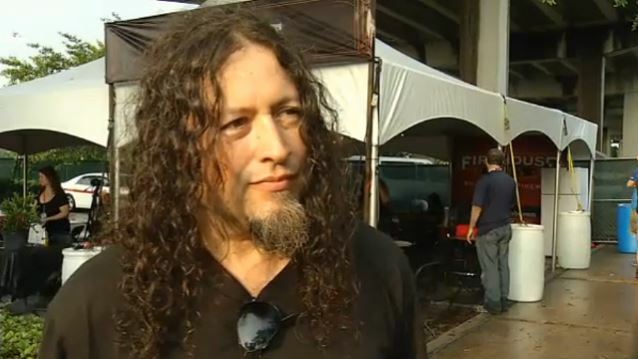 4Chords reporter Jennifer Kessinger conducted an interview with QUEENSRŸCHE guitarist Michael Wilton at the Welcome To Rockville festival on April 25 in Jacksonville, Florida. You can now watch the chat below. Speaking about the musical direction of QUEENSRŸCHE's forthcoming follow-up to the band's 2013 self-titled effort, Wilton said: "The new album is in QUEENSRŸCHE fashion. QUEENSRŸCHE is about evolving the music with every recording. We kind of let the listeners describe what we're doing, because the music's so personal to us, so I can't really say. But it kind of encompasses the roots of QUEENSRŸCHE, as well as kind of our viewpoint in the modern world right now. It has elements of the first six albums. But it's everything. It's not this or that; it's everything. It's everything that a QUEENSRŸCHE fan would want." Wilton also talked about how QUEENSRŸCHE fans have embraced the band's new singer, Todd La Torre, following the departure of the group's original frontman, Geoff Tate. "With the new lineup, it's really been great," he said. "It's been a rebuilding process. We've been doing big shows like this where we see a lot of people that haven't seen us since, like, the late '80 [or] early '90s. They come up to me and say, 'Michael, my God! I love the new QUEENSRŸCHE. Thank you for saving my band.' That kind of thing. And it's really a great thing to see so much support and so much, really, just heartfelt belief in the music and the band. And things have just… The doors have just opened for us, and we're getting all these offers, and everything is going great." QUEENSRŸCHE's new album is being recorded at Uberbeatz Studio in Washington with producer Chris "Zeuss" Harris (ROB ZOMBIE, HATEBREED, SOULFLY, SHADOWS FALL).